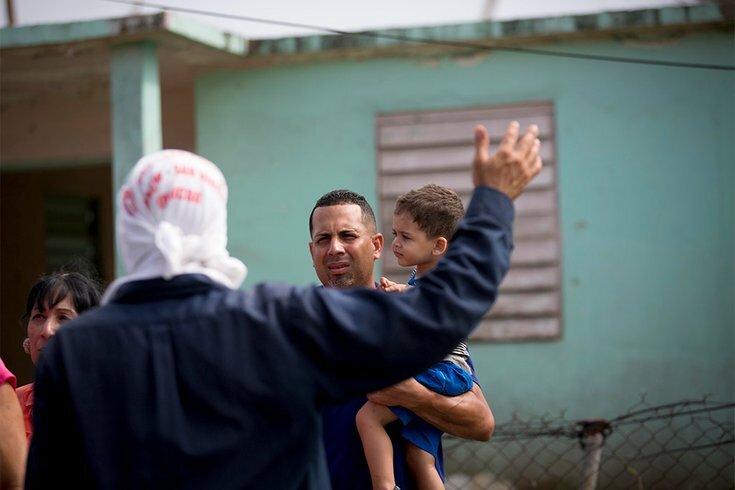 In this Oct. 2, 2017 file photo, a man and his son asks for water and food as a truckload of FEMA supplies are being distributed by the municipality in the city center of Yabucoa, Puerto Rico. More than 1,000 Puerto Ricans reportedly left the battered island and came to Philadelphia. Hurricane Maria evacuees in the Philadelphia area are faced with the prospect of their transitional-sheltering assistance vouchers from FEMA ending early next week. In an effort to help raise money for them, a Quizzo event will be held Sunday night at World Café Live. Helming the event is Johnny Goodtimes, who hopes the money will help the Poor People’s Economic Human Rights Campaign (PPEHRC) to find housing for the evacuees. He said hearing the story about a mother who evacuated Puerto Rico with three children was particularly heartbreaking. "Just by buying a ticket you can not only have a lot of fun with a great quiz and live music but you can change someone's life for the better," he said. Foto Rodriguez y Amigos will perform in between trivia rounds at the event, which starts at 5:30 p.m. Sunday. PPEHRC Founder Cheri Honkala noted the importance of helping the evacuees, and expressed gratitude that Goodtimes is hosting the event. She said FEMA has told her that more than 1,000 families of evacuees made their way to the Philadelphia area after the October 2017 hurricane. "The families from Puerto Rico have already been displaced from their home and their land," she said. "We can't stand by and watch families become homeless again. "The more money we raise, the more families we can help. Any evacuee sent to us will never be turned away. We also have a sign-up sheet on our website that people can sign if they have a spare room in their house." Tickets for the event are $20, with all proceeds benefiting the effort.